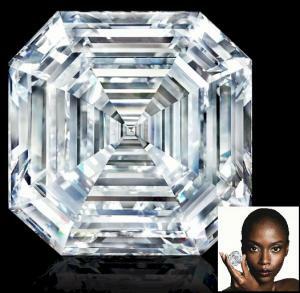 Image of the world’s largest square emerald cut diamond, the Graff Lesedi La Rona. Same geos that discovered Diavik & Grib diamond mines are now in the center of what may become a Tier 1 discovery at Arctic Star Exploration Corp. (TSX-V:ADD). NEW YORK, NY, UNITED STATES, April 13, 2019 /EINPresswire.com/ — London-based Graff Diamonds Limited, the luxury jeweler, unveiled its latest big diamond creation, the 302.37-carat D-color “Graff Lesedi La Rona,” a high-clarity stone considered as the world’s largest square emerald cut diamond. Graff states it is the “largest highest clarity, highest color diamond ever graded by the Gemological Institute of America (GIA).” Diamond dealer and founder of Graff Diamonds, Laurence Graff, who is responsible for cutting and polishing a majority of the 20 largest diamonds discovered this century, is responsible for this latest creation. The gem's D color grade (meaning colorless) is the highest end of the GIA color scale, a rarity for any diamond to achieve, much less one of more than 300 carats. All great diamonds start with their discovery, something everyone can participate in through a quality junior mining diamond exploration company. Further below is a brief overview of Arctic Star Exploration Corp. (TSX-V: ADD) (F: 82A1) (US Listing: ASDZF), currently engaged in one of the most exciting programs in the diamond exploration mining space — expanded copy of the review may be viewed at https://miningmarketwatch.net/add.htm online. The 302.37-carat D-color “Graff Lesedi La Rona” diamond was cut from a 1,109-carat rough diamond, about the size of a tennis ball, which was originally discovered by Lucara Diamond Corp., a Canadian diamond mining company, in November 2015, at its Karowe mine in Botswana — the largest gem-quality diamond discovered in more than 100 years and the second-largest in history. Its size is exceeded only by the 3,016.75-carat Cullinan Diamond, mined in South Africa in 1905, which produced nine major diamonds that are part of the British Crown Jewels. Laurence Graff purchased the rough in 2017. The gem was given the name, Lesedi La Rona, which means “our light” in Botswana's Tswana language. In addition to the main diamond, 66 “satellite” diamonds have been polished from the rough, ranging in size from under a carat to more than 26 carats. In June-2016 Lucara Diamond Corp. originally tried to sell the Lesedi La Rona in a standalone public auction at Sotheby’s London, considered by many industry participants as an unusual way to sell a rough diamond. Normally, rough diamonds are sold privately to diamond dealers who then cut and polished it into a finished gem. The standalone public auction created controversy among many dealers, of which Laurance Graff was one of those who criticized the sale. It had an estimate of more than $70 million, however it failed to meet its reserve price as bidding stalled at $61 million. In September 2017, Graff Diamonds announced that it had purchased the diamond for $53 million in a handshake deal between Graff and William Lamb, former president and CEO of Lucara. Once purchased, the diamond was moved to South Africa where Graff’s cutting and polishing processes are carried out. Arctic Star Exploration Corp. (TSX-V: ADD) (F: 82A1) (US Listing: ASDZF) is a Canadian-based diamond exploration mining company focused on advancing its flagship 100%-owned Timantti Property in Finland, located 17 km from the town of Kuusamo, and only ~450 km SE of the multi-billion dollar producing Lomonsov and Grib diamond mines in Russia. 'Timantti' is the Finnish word for diamond, and Arctic Star is now in the center of what could continue into a Tier 1 discovery. The large land package consists of a 243 hectare Exploration Permit and a 190,000 hectares Exploration Reservation. The caliber of the exploration professionals that are associating themselves and reputations to the project is impressive, they include the former lead geologists that discovered Diavik diamond mine in Canada, and the discovered nearby Grib diamond mine in Russia. See the full review of the opportunity at https://miningmarketwatch.net/add.htm online.